Sheet composting is a very good way to practice organic gardening. If you are following our articles you must be aware of what is a compost. Now, for making compost you need to store composting ingredients in a pile. But for an urban gardener, this is not a good news. Generally in urban areas space is a major constraint. Sheet composting solves this problem. This article will give you an idea about how to use it to your benefit. In sheet composting method you don’t heap the ingredients into a pile; rather you mix it directly with the soil. You can use a spade or a tiller for this purpose. Whatever ingredients you have planned to put into the compost heap will do. Grass clippings, manure, leaves, egg shells, tea leaves all will work. Try to use a balanced mix of Carbon (C) and Nitrogen (N) when adding to the soil. More on C/N ration in this article. You need to add these ingredients a couple of months prior to planting. As these ingredients are not decomposed while mixing in the soil, it requires a couple of months to degenerate and to release the nutrients. You can also add a layer of leaves or black plastic to increase the process of decomposing. 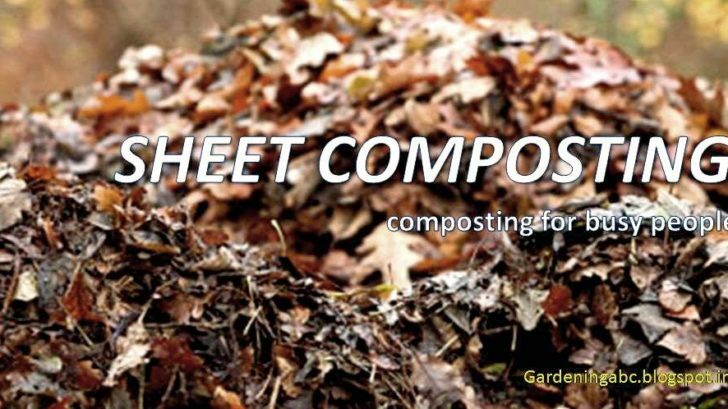 You don’t need to confuse sheet composting with mulching. The basic difference between the two is that mulching is used basically (even if you use organic materials) for weed protection and to retain water. Though it also boosts up soil quality it is not the primary focus of mulching; whereas sheet composting is done to boost the soil quality. Sheet composting is a very good process if your garden soil is of poor quality. It also saves the soil from erosion. It is a lot less time and effort consuming than traditional composting. That’s a good idea to write about mixing the composting material with the soil. I live on a 1/2 acre suburban lot with a large compost pile. After composting, I mix in a variety of chemicals and then create a new soil to replace the debris that the contractor used to create my yard. It’s a slow process. After 20 years the method seems to have worked out well. Thanks for the fine posting!